Anyway, now half the garments in my wardrobe are red, as are half the appliances in my house. So today I bring you five of my favourite things RED. Birkenstocks — For years one of my favourite pairs of shoes have been my red Birkenstock runners. (In fact, I have them in black and green too.) I bought a spare red pair last time I was in Germany, and I still haven’t broken them out. My existing pair have seen a lot of kilometres walked. Nespresso machine — I love this pod coffee machine. It’s no mess, no fuss, and although I acknowledge it’s not the best environmentally, plus it’s quite expensive to run, I couldn’t live without it and its accompanying milk frothing jug. Elliptical cross-trainer — Nice and compact, this slots into the space between the sofa and bookshelf and allows me to get some exercise in front of the TV. An important little machine for this sedentary writer! Painted glass (with wine) — A friend painted four of these for me, and I use them on rotation as my go-to glass for wine (red of course) on an almost-daily basis. Chair — Isn’t this chair cute? It was a completely spontaneous purchase a few years ago, but it’s very comfortable and looks great in the living room. What’s your take on RED? Let me know in the comments! Otherwise, to participate write a post and tweet to #WANAfriday. 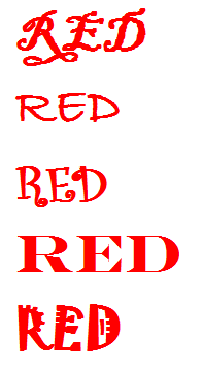 I’ll update links to other brilliant posts about red as they come up over the next day or so. Your painted wine glass is so pretty! I can see why you use it often. I love seeing all your red toys, and the song you posted is pretty cool. I’d forgotten Belly completely until I saw a recent “whatever happened to…” type thing on TV, and they showed the “Feed The Tree” video. I don’t think I ever heard any of their other songs. They are “Footprints” brand – Darlington model. I love your *red* collection, Ellen. I’m with Tami. I want a pair of red shoes like that too! Thanks, Elizabeth – red is so much fun! I vote for the red chair. It hugs the body nicely.